Trix is a fun and addictive game with simple, but challenging controls. Your goal is to catch all the bricks that are launched from the middle of the screen. With the 4 paddles you have to catch these bricks. The 4 paddles are all operated together. When moving 2 paddles up, the other 2 will move down. 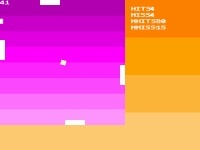 Trix is one of my older games that was supposed to enter a competition at DIV-Arena. But do to my vacation I was too late. The game never got past version 0.9. What does this mean? Well, it’s playable and all stuff is in there, including multiple levels. But due to some bugs I never found time for to remove there are some strange quirks. But beyond those few bugs the game is stable and playable.